Was this your first time visiting the Grainger Museum? Just before the start of the volunteer program, I got the chance to roam around the museum during my university summer break. And I remember always passing by this wonderful petite museum, and wanting to come inside, but I never really had the chance to do so until I signed in to the volunteer program. Why did you want to volunteer at the Grainger Museum? 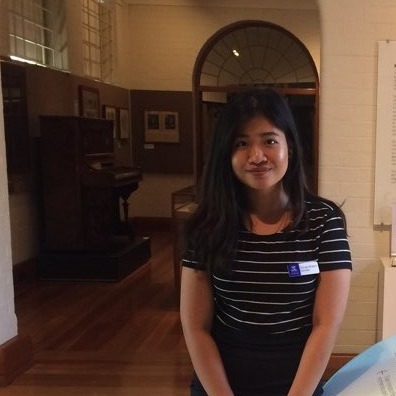 Mainly because I am very interested in working in museums and I feel like this would be a massive opportunity for me to gain experience and to have an additional activity that I am interested in, other than just studying for my Master's degree. Other than that, I feel like Percy Grainger was such an interesting figure and I somehow can relate to his eccentricity and quirkiness in some extend. What do expect volunteering at the Grainger Museum would be like? Hopefully if I do a good job enough, this volunteering program can lead me into pursuing career that links both my interest in museum management and my major, which is Global Media Communication. But other than that, I expect to meet more people with similar interest in museums like I do and to also gain more knowledge and experience in working in a museum. Coming from Global Media Communication major, what can you bring into your role as a volunteer in the Grainger Museum? Do you have a favourite object that is currently on display at the Grainger Museum? I would not say that this is my favourite object, but I do find it fascinating. There is a collection of Rose Grainger things that was kept by Percy and they are now displayed in the museum. Out of this collection, the one that stood out is a braid of Rose Grainger’s hair. It is interesting to see an actual biological piece of someone that Percy was attached to, and with having this piece in his museum, it shows how attached and adoring he was to his mother. Even before knowing how strange their relationship was to each other, I had an inkling feeling that it was anything but normal. because of that object.